Well this if I think of it, the hoopla around a possible Bajaj Pulsar 250 has now become a backyard pond, all that does happen to the pond is more and more weed flourish, without any sign of blossom what so ever. This year, it's a bit different. The new weed in the pond might show some signs of blossoms after all because the weed has some credibility after all. 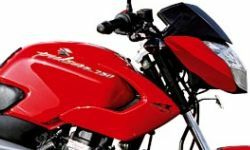 On 4th January, 2011, BikeIndia reported that a possible Bajaj Pulsar has taken shape and might be released by mid 2011. The above image has been taken from the BikeIndia website and it clearly shows 250 written on the tank. It's clear from the above picture that Bajaj is targeting the Pulsar 135LS platform for the proposed 250cc bigger Pulsar and which makes perfect sense as this the direction the bigger and obviously better Pulsars should go. But having said that, I clearly mean that I would appreciate the Pulsar 135LS engine platform being considered and taken for building the 250cc engine. A Liquid Cooled, DOHC, 4 Valve Per Cylinder engine is what's required to juice out the 250cc mill. Truly speaking, I would love to see a twin cylinder mill coming for the bigger Pulsars, but I know that would like expecting too much. At the same time, the Pulsar 135LS body styling would look puny for a 250cc motorcycle without any further addition. One cannot expect to plonk a bigger engine into the same chassis and bodywork. It's just not gonna do justice to the entire package. So, I really do hope that Bajaj engineers are considering that because if the above picture is to be believed (which actually is showing at "250" logo on the tank), then the 250cc motorcycle's gonna look grossly malnutritioned. Bike India also claims that the motorcycle would be sporting a rear mono-shock and that's a very welcome change, both from the design perspective of Bajaj motorcycles (read graduating to the next level) and also from the handling perspective of the proposed bike. Come to think of it, Bajaj partners with a company which employs one of the best suspensions in business - KTM, and taking cues from them would be next best logical thing. It would be amazing if Bajaj takes cues from both Kawasaki and KTM to build the bigger and the best Pulsar till now. Imagine how it would to throttle an insanely high revving Pulsar which sends the tach needle berserk with a slight twist of your right wrist. Yeah, asking for more than one cylinder is asking for too much. In more motorcycling-developped zones multicylinders have been happening for a century now! Mono-shocks! How banal can we get. What is wrong with the twin shocks that we have in ALL the motorcycles across the spectrum currently? Mono-shocks, ptew! Power! Don't we have more than enough power already in the 21Ps motorcycles! Besides what will you do with all that power. You spend most of your time in front of the computer anyway! I do seriously feel that the day of motorcycling is at dawn in this part of the world, when it's already noon at many places. But the good thing is.. things have started to move in the right direction in the past 2-3 years. Though more credible than amateur blogs, I would still like to take the "Speculations" of auto publications with a tablespoon of salt. Yep, as Kenda put it, I agree that most of our time is spent in front of the laptop or as I would add to it, with our family. But that's the curse of getting tied down by a 9 to 5 job and being married (either of which we can't leave).